2017 NCAA March Madness is in full swing. Keeping athletes healthy through a long physical basketball season is a challenge. Understanding biomechanics of movement is key in that endeavor. Prevention of ankle sprains and ACL tears are of high importance and training to that end has evolved significantly in the last several years. Weight training programs have progressed from open chain thera-band exercises and Isokinetic knee extension strengthening to more sport specific and functional weight bearing exercises replicating the biomechanics of basketball movements. A Star Excursion Test has been shown to assist in screening for ankle sprain risk. As in so many functional tests, the test can also become the exercise. In doing so, ankle sprain risk can be decreased. To test: have the athlete stand on the right leg. Then reach the left foot as far as possible keeping the left foot just off of the ground. At the same time, allow right knee to bend as you reach with the left foot. Direction of the reach can be changed to alter the stress on the standing leg/ankle. Use this same test for strength and balance training in your athlete’s workouts to challenge lower leg strength for the prevention of ankle sprains. Additional challenge can be added by using TRI-STRETCH under the standing foot. The foot can be placed with the foot in a more plantar flexed position (replicating the foot as it lands coming down from a rebound) by placing the TRI-STRETCH in a backwards(or downward sloping) position. For ACL prevention, training the quad and hip musculature to decelerate loading of the leg when landing is imperative. Performing tri-planar single leg split squats is an excellent training tool. 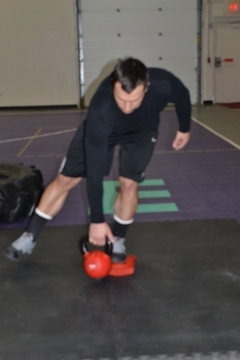 Using a device like TRI-STRETCH can enhance split squat training by allowing pre-positioning of the squat leg into a more pronated position increasing transverse plane motion at the knee....the position that stresses the ACL and puts the ACL in harms way if this motion is not controlled. For more information on functional training, hundreds of new exercises and the TRI-STRETCH squat program DVD , click here.